These pesky marks can be white specks or streaks left on dark clothing or blue and green residue on light-coloured items. But what is causing the problem? Here are a few reasons why white streaks appear on your laundry and what you can do to stop this from happening. 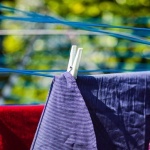 It can be tempting when washing a particularly dirty load to just add more detergent, but this could be what’s causing the problem. Always check the dosage recommendations on the instructions and follow the advice. For stubborn stains, try an in-wash stain remover and adjust the temperature and cycle to suit. Powder detergent can sometimes take longer to completely dissolve. If the streaks keep appearing try switching to a liquid detergent instead. Or, if you prefer to use powder, try pouring the detergent into the empty washer before adding your load. That way it will have more time to dissolve. A common cause of these marks is overloading your machine. 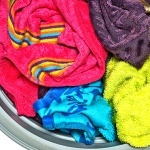 If there are too many things in your washer, this could be another reason why your detergent struggles to completely dissolve as it can get caught in folds of clothes. Check the load before washing and empty some items if needs be. 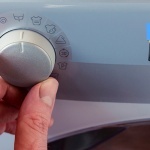 It may not look like it from the outside, but if your washing machine hasn’t been cleaned in a while there could be a build up of limescale, soil and minerals that could be affecting your clothes. To prevent this, regularly clean your machine with a cleaner and descaler and keep your machine and laundry clean! Now you’ve discovered what could be causing the problem, what do you do with clothes that have already been damaged? First, try re-washing the clothes without any detergent in the machine. Instead, use a a cup of distilled white vinegar. This should help the clothing fibers relax slightly and release the residue. If the clothes are already dry, it may be harder to remove. Try filling a sink or bucket with warm water and a gentle bleach (such as oxygen-based or all-fabric), leave the items to soak overnight, then wash as recommended without adding any detergent.